Only 38 per cent of members who cast ballots March 8 voted in favour of that deal and then walked off the job at ZF-TRW. WINDSOR, Ont. — Fiat Chrysler Automobiles on Monday resumed production of its minivans after striking Unifor workers at a major supplier ratified a new three-year contract. In a tally released Sunday, 87 per cent of ZF-TRW employees who voted favoured the deal, up from the 38 per cent who did so three days earlier, the union said. A number of changes in workplace rules, not salary, turned the tide. About 300 workers at the supplier assemble shocks, struts, springs and rear suspensions at two facilities for FCA, which builds the Chrysler Pacifica and Dodge Grand Caravan in Windsor. Picket lines at the two ZF-TRW facilities in Windsor disassembled immediately after ratification. 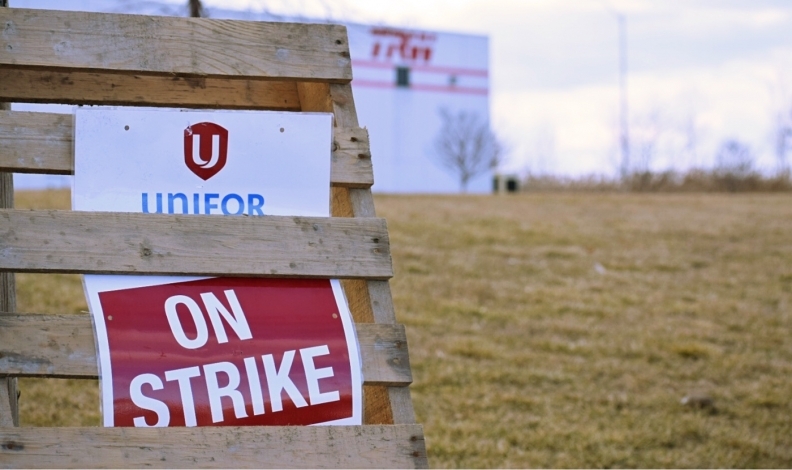 Unifor members who work at the minivan plant reported for their regularly scheduled assignments, beginning late Sunday night on the midnight shift. Unifor Local 444 President James Stuart said FCA was immediately able to access finished ZF-TRW products destined for the automaker’s minivan plant, but that were left on the supplier’s lot during the walkout. Getting access to those finished parts Sunday helped the automaker to resume production. The strike, which started Friday, eventually forced FCA Canada to cancel three Saturday shifts in Windsor. FCA did not respond to emails and calls placed by Automotive News Canada. ZF-TRW workers first rejected a tentative contract endorsed by their bargaining committee. It was a deal that served as a pattern for four ratified contracts for three other suppliers -- Dakkota, HBPO and Avancez Assembly -- in the Windsor region. The pattern includes a 10.3 per cent raise over three years, moving the current hourly wage of $19.40 up to $21.40 by September 2020. It also bumps the employer’s mandatory pension contribution to 4 per cent in March 2019, up from the current 3 per cent. It also bumps the matching contribution rate to 2 per cent, also in March 2019. ZF-TRW workers didn’t have a problem with money, though. They wanted the company to hire more people, allow employees to use banked time off more frequently throughout the year, and increase the number of granted time-off requests in a single day. They also wanted to access annual bonuses at times other than Christmas. The company agreed to it all, according to the union. ZF-TRW didn’t immediately respond to a request for comment. “After the first ratification vote, it was obvious we misread the membership in regards to ZF,” Stuart said. ZF-TRW’s response to Unifor’s strike “was simply, ‘hey, we agreed to a pattern,’” Stuart said. So, without increasing salary or pension, the two sides agreed to “significant workplace changes,” including 15 new hires. Stuart said he didn’t want to speak for FCA Canada, but did say the automaker expressed it “was frustrated” by the negotiations and strike that ultimately cost the company a day’s worth of production. The 2018 Chrysler Pacifica, Chrysler Pacifica Hybrid and Dodge Grand Caravan are assembled during three daily shifts at the 89-year-old factory. The plant, which now employs nearly 6,000 people, began building minivans in 1983. It’s the automaker’s only plant that produces minivans and churns out about 1,400 vehicles a day. In the United States, FCA had a 74-day supply of the Pacifica on hand on March 1, higher than levels considered ideal. The plant also builds the Dodge Caravan, which had a 23-day supply. Days of supply aren’t publicly reported in Canada.